Is It Immoral to Cut the Budget? At the producer level, rising inflation is now unmistakable and indisputable. Even excluding food and energy, producer prices have been rising at a 2% annual rate since the beginning of last year, after rising by only 0.9% in 2009. Moreover, core producer prices rose at a 4.2% annualized pace in the first three months of this year. This chart plots the producer price index on a semi-log scale, in order to highlight the different inflation regimes of the past several decades. 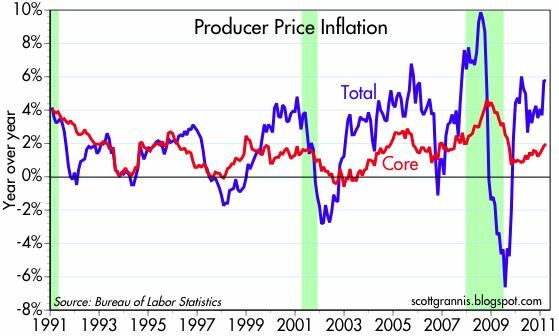 Producer price inflation now appears to be accelerating beyond the 3.5% annual pace which prevailed from 2004 through last year, and far beyond the 1.7% annual pace which prevailed for the preceding 20 years. Over the past six months, the PPI is up at an annualized pace of almost 11%; over the past three months, prices have risen at an astounding 13% annualized pace. These charts are an early-morning wakeup call that continues to be ignored by groggy Fed chairmen. I don't think the Libyan revolt and NYMEX zaniness can be laid at the feet of Ben Bernanke, a man deeply schooled in both the American Great Depression and the ongoing Japan Perma-Gloom. Corn and cotton are also in odd peaks (although if you want to bash to USA federal rural-subsidy ethanol program, I am right there with you--it is much more a cause of corn inflation than Bernanke). Further, cutting back on the money supply in face of suddenly higher oil prices might plunge the USA back into recession--a deep recession that we are just now clawing out of. Can't say I am worried about inflation--I am worried about economic growth, now decelerating below 2 percent (first quarter figs). Please Mr. Bernanke, put the the pedal to the metal. Well said my friend. That covers many Americans these days. I hope people wake up on all of those fronts. Please review charts of the dollar's exchange rate. It is back were it was decades ago. The dollar was here in 1980 and 1997. We did not die. How is this a collapse? You sound like another of the Chicken Littles running around the econo-landscape. I expect the lower dollar to keep doing what it is doing: Surge our exports, now one of the growth engines of the US economy. I like this, I like prosperity. Give to me more prosperity, especially from exports. I know of many nations that exported their way to prosperity. I know of no nation that imported its way to prosperity. The problem is that the dollar, as the international reserve currency, has been been overvalued since Bretton Woods.